Observation - Horse Chestnut Leaf Miner - UK and Ireland. Description: A few of some 100+ moths sheltering from the wind on the lee-side of a tree trunk close to a couple of Horse Chestnuts. 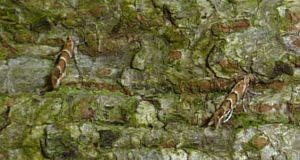 A few of some 100+ moths sheltering from the wind on the lee-side of a tree trunk close to a couple of Horse Chestnuts.